Horticulture brings together people, plants and places. Horticulturists produce fruits, flowers and plants; design, install and maintain parks and gardens; and manage sports fields and golf courses. Horticulture at KPU combines scientific principles, aesthetic values, sound business practices and community awareness to produce and manage plants and landscapes. 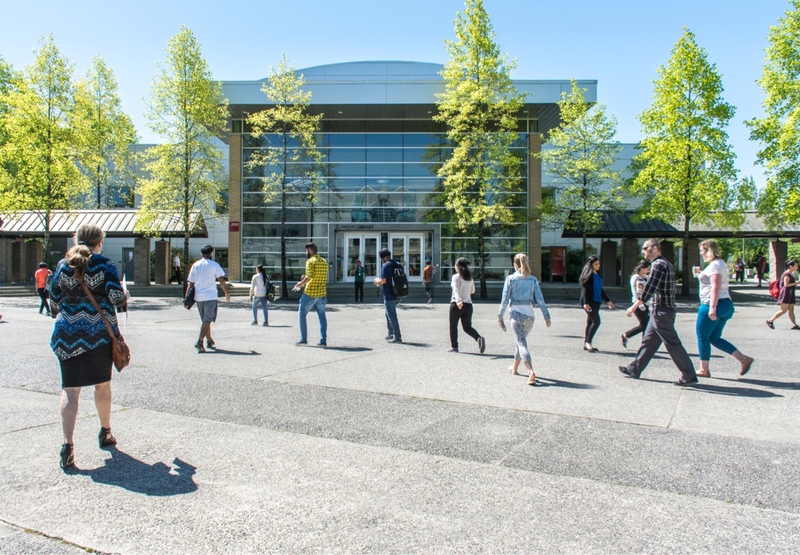 Many programs ladder into higher KPU credentials. Faculty and staff have lived commercial horticulture, are active in the industry and are committed to excellence in teaching. Small classes provide students participatory learning environments: work on your career goals today while planning for the future! Choose from trades qualifications, citations, diplomas or degrees. Email horticulture@kpu.ca for details! Students in HORT 2493, Crop Development, took time to showcase their research projects in a poster conference at the Langley Campus. Topics included growing Cordyceps mushrooms, identifying the benefits of using mycorrhizae to improve tomato grafts, comparing LED / HPS lighting on cucumbers, and effects of feed on worms on subsequent growth of lettuce plants. Students commented how much fun a research project had been over the semester, and how it connects real world to the classroom. Save the date! Don't miss our annual KPU Horticulture Plant Sale on Saturday, May 4. Spruce up your garden with hanging baskets, perennials, annuals and more! 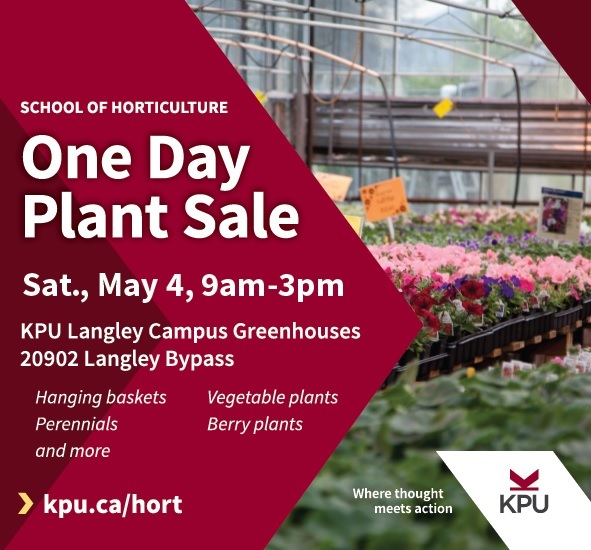 The Plant Sale is held at the KPU Langley Campus Greenhouses (20902 Langley Bypass), across the street from the main campus and runs from 9am-3pm. During landscape construction this semester, the HORT 2426 class undertook a project to revamp the front entrance of the Horticulture Plaza at the Header House. The project was to build a new arbour for hanging baskets and also extend the paver pad to make it more accessible. The 2426 class has some graduating students as well as some continuing on for their degree. 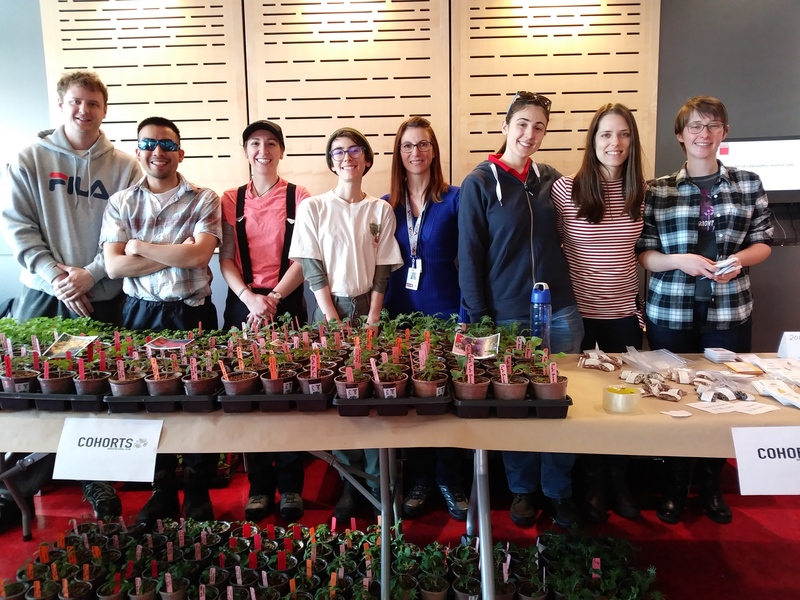 On March 9th, 2019, CoHorts partnered with the Langley Environmental Partners Society to host Langley's second annual Seed Celebration. This event featured a selection of tables where local organizations could exhibit the work that they do around seed-saving and education, as well as two fascinating workshops. The first workshop was held by Maria Valana, an experienced gardener and instructor here at KPU, and covered the basics of gardening, while the second workshop, facilitated by Susan Davidson of the BC Eco Seed Co-Op, featured a conversation about the practice of seed-saving. Overall, the Langley Seed Celebration drew a variety of people from across the Lower Mainland together to talk about the importance of seed-saving and its role in creating healthy, thriving, and sustainable food systems. KPU Turf Management Graduate Ben Zlotnik is now working with Major League Soccer (MLS) in Toronto as a Field Manager at BMO Field. At the end of last year, they renovated the irrigation system, hydronic heating system, SubAir systems and new infield sensors. They also added 7 new grow light units which brings it to a total of 15 grow light units. At the beginning of April, they will be stitching their field with a system called Sisgrass. It’s a hybrid pitch system which means synthetic fibres are stitched into the field/root zone to help stabilize the playing surface and help strengthen the plant. They are left with a field that is roughly 95% natural grass and 5% plastic. This system was used at multiple World Cup stadiums last summer and is now being used by the Green Bay Packers along with many European and Middle Eastern clubs. We were invited to participate in a community outreach opportunity at Art’s Nursery in Port Kells called the Autumn Scarecrow Festival. A creative endeavour for charity. This year O.W.L. (Orphaned Wildlife Rehabilitation Society) and the Inclusion Langley society are the recipients. The KPU CoHorts and faculty members Maria Valana and Janis Matson have created a unique Scarecrow at Arts Nursery. The scarecrow depicts a dream catcher made from tools and materials found in horticulture. The idea is to inspire people to follow their horticulture dream by studying at KPU. The sign on its waist offers a hint to the entity of the scarecrow as it reads “Catch Your Horticulture Dream at KPU”. As alumni of our Diploma program themselves, the young management team of Corné and Paul Moerman at Sunnyside Produce provided current students with technical insights into the management of their new construction project suitable for the modern world of greenhouse crop production. Adding a new 6.5ha glasshouse, energy centre, fertilizer room and packhouse to their existing 12ha operation in Delta, BC, the cousins shared some of the highlights and challenges of overseeing this now while planning on future needs. Capable of producing delicious highest quality, high yield bell pepper crops, the 6.5m tall glasshouse will utilize double screens, nutrient re-circulation and rain water capture to provide sustainable production techniques for now and the years to come. 10 years ago, Patrick Dooley was a promising young golfer almost graduating from high school. Patrick was excited about a career in the golf industry and planned to enroll in KPU Turf Management diploma Fall 2008 when he died of a sudden illness. His family began the Patrick Dooley Memorial Scholarship Fund to annually support a worthy KPU Turf Management student. On April 27, 2018 the KPU Turf Club hosted the 3rd annual Patrick Dooley Memorial Golf Tournament to raise funds for this scholarship and celebrate Patrick’s memory. Editor's note: Stan would never think to recognize his own efforts so we'll do it for you. Thanks Stan, this event would not happen without you! KPU's School of Horticulture goes global with this innovative Plant Database App that takes plant and pest identification to a whole new level! This app has been developed to help users quickly identify plants using smart phones and tablets. There are over 1500 plant entries and 20,000 images with close-up details of the leaves, flowers, fruits, or cones taken from the full web version of the KPU Plant Database. There are direct links to search the internet for more information on each plant or pest entry. Plant and pest favourites can also be stored (to review for tests, for consideration in a landscape plan, etc.). The paid version allows users to upload their own images with searchable descriptions as a means to record where and when the plant was found. These plants can then be found again to observe seasonal changes, to help other users locate the plants, or to monitor plant growth or pests. Students can even create personalized digital herbarium or bug collection to become better prepared for tests!